India had a disappointing outing at the 43rd Chess Olympiad with the men's team finishing a poor sixth and the women ending their campaign at a lowly eighth spot here Friday. Both the Indian men and women's teams finished their campaign garnering 16 match points each. It was a day of drama for the medal contenders but India's hopes had waned once China and United States settled for a 2-2 draw on the top board and Russian men beat France 2.5-1.5 to reach an identical 18 points. The tie-break depended on the Sonenborn-Berger, the chess equivalent of Duckworth-Lewis though a bit less complicated. The tiebreak is based on each tied team's performance against their respective 11 rivals and in the end China pipped United States to take the gold in the men's section while the Russians ended with the bronze medal. It was a double treat for China as they came back from jaws of defeat in the women's section against Russia and the 2-2 draw was enough to win the gold. Tying with Chinese women on 18 points, Ukrainian ladies won the silver here while the bronze went to Georgia 1. Having put together the best ever teams in both men and women section, this was a missed opportunity for both the Indian teams. Nevertheless, there were some lessons to take back home too as they lost matches in the second half -- something that can prove costly in a massive event that has global participation. For records, the Polish team that played with top eight seeded teams finished fourth and England came from behind to take the fifth place ahead of Indian men. 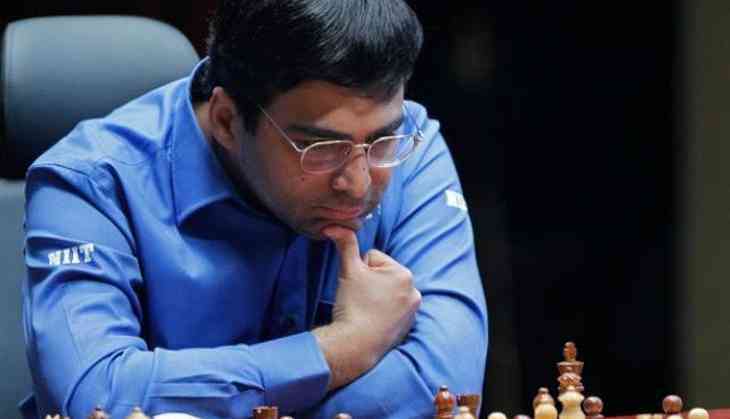 Viswanathan Anand settled for a draw with Duda Jan-Krzysztof in just 25 moves out of a Petroff when the Indian ace could not claim any real advantage with white pieces. P Harikrishna then signed peace with Radoslav Wojtazsek on the second board while Vidit Gurjrathi could make no headway and settled for a draw against Piorun Kacper. B Adhiban tried real hard, sacrificing a piece in the endgame against Jacek Tomczak but in the end had to split points. Personally, except Gujrathi, all the Indian men performed above their ratings which means a marginal gain for everyone in world rankings. Anand scored 5.5 from nine games, Harikrishna scored 7/10, Adhiban 5.5/8 and Sasikiran ended with 6/8. Gujrathi made five points from his eight outings. The Indian women team were under serious pressure at some point against Mongolia but pulled things back thanks to Padmini Rout and Tania Sachdev. On the top board, D Harika played out a draw against Batkhuyag Munguntuul and Tania Sachdev defeated Nomin-Erdene Davaadembere. Eesha Karavade then drew with Turmunkh Munkhzul on the third before Padmini accounted for Yanzindulam Dulamsuren. Tania Sachdev emerged as the best Indian performer in this section scoring 7.5/10. It was a pity that she could not win a bronze medal for her personal result falling short by just one point after clocking a rating performance on 2441 points. Apart from Tania, Padmini was the only Indian who ended gaining some rating points scoring 5/7. Humpy scored 5.5/9, Harika did well to reach 7/10 while Eesha ended with 4.5 from her eight games. Final Standings Open: 1-3: China, USA, Russia (18 points each); 4-5: Poland, England (17 points each); 6-14: India, Vietnam, Armenia, France, Ukraine, Sweden, Czech Republic, Germany, Austria (16 points each). Women: 1-2: China, Ukraine (18 points each); 3: Georgia-1 (17 points); 4-12: Russia, Hungary, Armenia, USA, India, Georgia-2, Azerbaijan, Kazakhstan, France (16 points each).